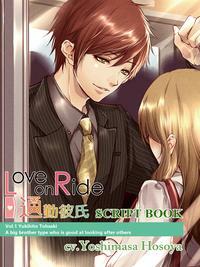 This is an ebook of scripts in English based on the CD, "Love on Ride (Tsuukin Kareshi) Vol. 1," voice acted by Seiyuu, Yoshimasa Hosoya. One day you met a fine looking young guy on the train to the office, and he turned out to be your childhood friend!, Tohsaki Yukihito. He'd grown into a handsome man! with a heart full of kindness and passion. You started to see him again and again on the same train.